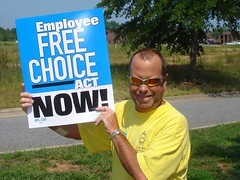 On Tuesday, August 19, over 150 union members and supporters converged on Hickory, NC to tell the truth about the Employee Free Choice Act. Visit our photostream for pictures of the event. Did you take pictures? Send them to us. The legislation would reform America’s broken union election system. It has passed the US House of Representatives earlier this year but stalled in the Senate due to a filibuster. Several workers spoke in a roundtable discussion about the Employee Free Choice Act and the importance of unions, especially during tough economic times. “A union card is the best opportunity for workers to get ahead and join the middle class,“ said Jim Davis, an Embarq employee, and President of CWA Local 3672 in Hickory. North Carolina workers are standing up for their rights. Now it’s time for Congress and the President to stand with them. 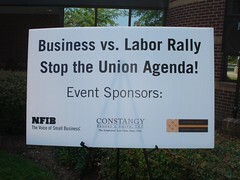 The Hickory Daily Record covered our event and the Chamber’s “Business vs. Labor” event. Channel 9 in Charlotte also interviewed UAW Local 5285 President Bob Riggins, who was part of a large group that stopped by the anti-union event before joining ours. AFL-CIO Now, the national AFL-CIO’s blog also wrote a story about our event. By electing a worker-friendly president and a worker-friendly, filibuster-proof majority in the Senate, we can ensure fairness for all American workers. Sen. Barack Obama is a co-sponsor of the Employee Free Choice Act in the Senate, while his Republican opponent for president, John McCain, opposes the bill.